It's that season again where I am back on YesStyle to shop for some summer clothes. I avoided shopping for clothes on YesStyle for spring and will also not be buying anything in the fall until winter time again to buy a few items for winter because I'll be doing all my fall shopping in Japan! =D I actually don't really have that many summer items that I want to buy from YesStyle this year, there are just a few things that I want that I know I won't be able to find at H&M or Forever 21 here. I bought two pair of circle colour contact lenses again. I used to have a pair but it expired and I trashed them away. I didn't even get to wear the pair I had that much so I wanted to buy 1-2 new pair again. This time I'm hoping to wear them more often and not waste them, like maybe wear them once a week? I got two pairs that are not too large in diameter for a natural look so I could wear them daily if I wanted to. 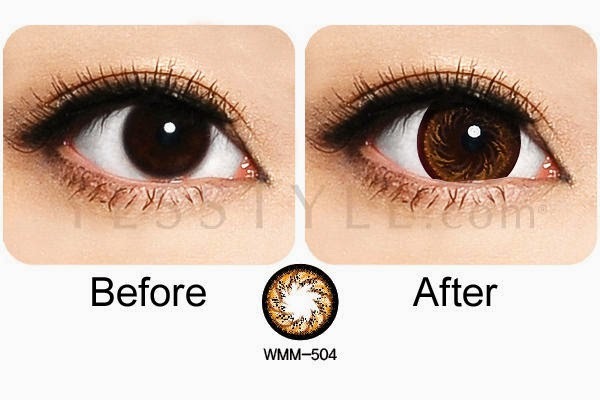 The first pair I got is from the brand Cafe Mimi Lens in 3 Tone Macchiato Brown. They remind me of the ones that famous Japanese model Masuwaka Tsubasa wear from her Princess Mimi Cafe series. They are 14.8mm in diameter giving your eyes a little enlargement but not too big and they last for a year with proper care and cleaning after opening them. I wanted a pair that would enlarge my eyes a bit but not too much that it looks too dramatic and this pair was a great size for that! I also like the colour of the brown too...not too dark and not too bright. 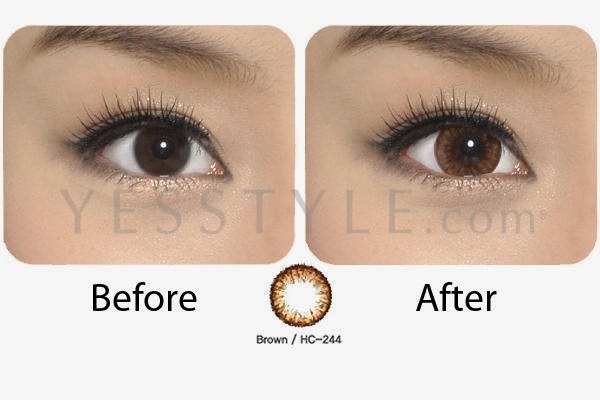 The second pair I got is the from the brand Magic Colour Lens in Grang Grang Brown. This one is only 14.2mm in diameter which is much smaller than the first pair for that natural look. I like how this one is a little brighter in colour but still a bit subtle and not too over the top. It also lasts for a year with proper cleaning and care after opening them. I am currently still waiting for the contact lenses to come in the mail and will do a review on them of me wearing it when I have time.